British Air Chief Marshal Sir Stuart Peach this week warned that “Britain’s trade and internet are at risk of catastrophic damage from any Russian attack on underwater communications cables…” He went on to warn that the UK and its Nato allies must prioritize the protection of the lines of communication from the threat posed by Russia’s increasingly modern navy, including nuclear and conventional submarines and ships. Attacking undersea cables is nothing new. During World War I both the allies and the Germans cut undersea telephone and telegraph cables. The Germans even obliged by leaving notes attached to the cut cables! German note left on a cut cable. The note said “No more Reuters lies on this line,! 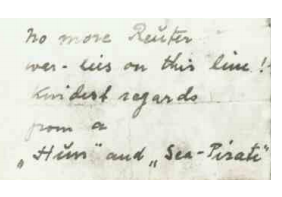 Kindest Regards, from a ‘Hun’ and ‘Sea- Pirate.’” As a courtesy the German notes were written in English. The Germans used submarines and surface craft and divers. One of them, U-151 can be seen in this World War I photo. The Germans cut undersea cables from New York to Nova Scotia and from New York to Panama, but to little avail. Cable cutting was also an enterprise in World War II. The British used XE class submarines to cut Japan’s undersea cables linking Hong Kong to Saigon and Hong Kong to Singapore. Of course when you cut cables you lose the ability to spy on communications, so on balance cutting cables was not the most productive strategy. Protecting undersea cables is very difficult, and in these days of fiber optic cables vast amounts of information can be carried on these lines. Repairing them is far more challenging than it was some decades ago when the cables were made of copper strands. But the real threat today is not disruption. Were the Russians to cut undersea cables they would probably do themselves as much injury as anyone else because the same cables feed Russia and enable it to communicate to the rest of the world. Moreover, when you cut undersea cables you lose a great source of intelligence. But there is more than one kind of undersea cable. Some cables are tied to special sensor systems. That is what the real threat is about. Two years ago I wrote the story of what the Russians are doing and why it has important national security implications, rather different from the concerns expressed by Air Chief Marshal Peach. When the latest Russian ocean surveillance ship, the Yantar (Amber) sailed off the coast of Florida, US Navy senior officials sounded an alarm. 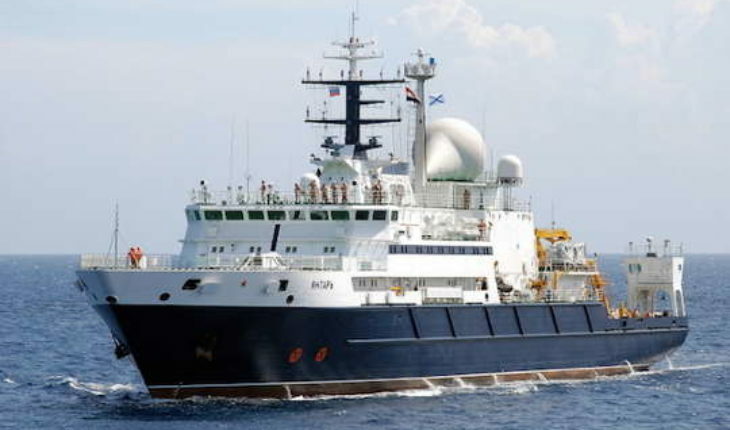 The Russian ship, they said, carried deep surveillance underwater vehicles which could be used to cut the fiber optic cables that connected the United States to the rest of the world. Speaking strictly on background they opined that the Russians were mapping the cables’ locations, either so they could cut them and knock out US communications in future, or they could be planning to attach listening devices to the cables, something the US and UK have been doing for years. The Navy alarm came about because American sensors located near the cables had detected the Russian ship’s activity. There is no evidence that any deep submersible vehicle was deployed, but among the published stories was news that the surveillance ship activity meshed with significantly increased Russian submarine activity. Presumably the Russian submarines were picked up by these buried sensors. This is not the first alarm bell on Russian underwater activity growing, perhaps approximating Cold War levels of activity. For example, the Norwegians recently complained about the same thing. Where did the Norwegians get the ability to detect Russian underwater activity? Either from information shared by the US and based on similar sensors off the Norwegian coast, or perhaps from sensors put in the water by the Norwegians themselves. But the real story is not the underwater cables. There is no real incentive for the Russians to cut the cables because these cables can supply Russia with plenty of valuable intelligence so long as they are functioning. And the US military has many alternatives to underwater cables for vital strategic communications, including satellites, frequency hopping secure radios, microwave transmissions, as well as other classified means (which could include cables but not where the Russians were looking). The actual Russian interest is the underwater sensors. Indeed, the very fact that Navy officials actually referenced the presence of the sensors is unusual. Underwater sensors are a means of tracking submarines. Every submarine has an acoustic signature which is made up of the cavitation sound of the submarine’s propellers, the noise created by machinery operating in the vessel, and the sound of the submarine actually cutting through sea water. The underwater sensors can pick up this noise if they are properly located, and over time can distinguish one submarine from another. One significant Russian victory in the 1980’s was to obtain advanced multi-axis profiling machines from Japan capable of manufacturing “silent” propellers which lowered the acoustic signature of Russian subs dramatically. It became much more difficult for US subs to actively track the Russians. When a Russian submarine knows it has been detected and under active tracking, it can drop its speed, deploy acoustic decoys, and escape. But underwater acoustic sensors are passive. They sit quietly and if they pick up a track they transfer that information over an underwater cable to a command center. If the Russians are able to identify the location of such sensors, they could either shut them down or put noise generators in the water that would make it hard for them to function. In order to launch any attack on underwater sensors, you need a means to get to them. The best way is an underwater vehicle, preferably one that has sophisticated manipulator arms that can disable the sensors in situ. In the 1980’s the Soviet Union’s Academy of Sciences made a deal with the Finnish firm Rauma-Repola’s Oceanics subsidiary for a deep sea submersible vehicle. The Shirshov Institute of Oceanology teamed with Oceanics to build the Mir Deep Submergence vehicle. The vessel can reach depths of 6,000 meters, giving the Mir a capability shared by the US submersibles Alvin, Sea Cliff and Deepstar 20000, Japan’s Shinkai and France’s Nautile. The Mir is built from a unique maraging steel alloy that contains nickel, chrome, and titanium. A key technology is syntactic foam, a special composite material vital to the underwater vehicle. The US company 3-M refused to sell any foam to Finland, but a Finish company (Exel Oyj) was able to develop a local version of the highly specialized foam. It is critical to the buoyancy of the submersible. The depth of 6,000 meters means that the submersible could function over 98 percent of the ocean floor meaning that all the underwater sensors, if they could be located, would be exposed to Russian surveillance ships. A key technology that appears on the Mir and Rus submersible are sophisticated underwater manipulator arms. Without them, it would be far more difficult to destroy US Navy listening devices. Manipulator arms can be used to pick items up from the ocean floor, cut cables, disable underwater mines, and for other commercial and military tasks. The Yantar carries two submersible vehicles. Each of them is equipped with a variety of sensors, cameras, and lighting and each carries a three man crew. Thus, Russia’s latest operation off the coast of Florida is not any accident: it has a strategic purpose. The transfer of vital technology has helped enable Russia’s revolution in military affairs and is once again a threat to the United States and America’s allies.